Shirts With Random Triangles: Florida QB Treon Harris And CB Jalen Tabor Suspended For Game Against Tennessee. Florida head coach Jim McElwain announced the two player's suspensions following the Gators' practice Wednesday. 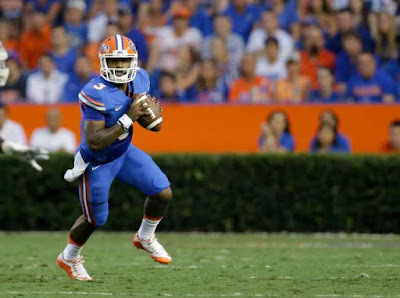 Harris was the starting QB in the Gators' season-opening 61-13 win over New Mexico but served as backup to freshman Will Grier the past two games. He served a brief four-day suspension in October of 2014 after being accused of sexual assault but was reinstated after the accuser recounted the accusation. Tabor started in two of Florida's first three games this season. Andy Hutchins of Alligator Army suggests that the "defined lengths of (the) suspensions" are "consistent with second violations of Florida's drug testing policy."